Chives that I rescued from the frost in November. I thought I'd pop in this weekend and give you all something to read, seeing as I missed last week and I don't have much to report this week in the way of frugal accomplishments either. 1. Houseplants! I planted my amaryllis bulbs (purchased two years ago) before Christmas and they are just starting to grow leaves. At the same time I also replanted some garlic cloves that had started to sprout. These were also free from my garden. It's almost... therapeutic for me to see green things in the dead of winter. 2. Baby laughs. Our little princess has started "laughing" recently, especially when other people are laughing. She smiles really big, then makes a "heh-heh" noise. It's so precious. 4. Herbal tea and hot baths. It's cold here; REALLY cold! Like below zero some days! So warm water in various forms and applications has been much enjoyed. Apart from those things, we've still been busy with parties and get-togethers and such. I hope you are all having a wonderful year's end. A dolly diaper bag, ready for gifting! Well, we had another hectic weekend. It's funny, because most people really look forward to the weekends and doing "fun" social stuff. Me, I look forward to Monday when I can have some time to myself, enjoying my home and baby. If it were up to me, I'd spend the entire Christmas season making gifts or ordering them online, reading books and sipping hot tea. But, you know. Opposites attract. So Hubs takes us gallivanting around the countryside on the weekends. I do my best to prepare stuff on Friday and then do damage control on Monday. Groceries: I went to two different stores last week: our local higher-priced grocery store as well as Kroger. I'm going to save the Kroger haul video for next week, but I thought I'd mention it because I bought... CHRISTMAS CANDY! With two Kroger eCoupons I was able to snag the candy for between $1.45 (M&Ms) and $2.54 (Peppermint Kisses) per pound. Which is pretty darn good for chocolate! I am going to use some for baking, some for gifts and some for plain old snacking. Nom. ​2. Cooking: I cooked one of our $6.50 turkeys from Thanksgiving. I ended up putting just 3.5 pounds in the freezer, but we pigged out on it for lunch, plus I used some for soup the next day. I also made 2.5 quarts of broth with the bones. In addition to the turkey, I canned 7 quarts of free venison that was given to us. 3. Line dried three loads of laundry plus all cloth diaper laundry. 4. Downloaded a free video editing app to my new computer. Yay!!! My Youtube videos have been sadly lacking lately due to lack of a video editor (YouTube dumped theirs in September... thanks a lot YouTube!). The one I'm using now is Animotica. I've repeatedly tried to buy the upgraded version in order to remove the watermark, but I keep getting an error message. 5. Worked on Christmas gifts. I had a fun time this year picking out gifts for people. Prices for gifts ranged from $0.00 to $80.00. I think our average cost per gift between siblings, parents, nieces and nephews was probably between $15.00 $20.00. Gifts are something that we don't try to pinch pennies on, but of course... if I can save a buck, I will. We had six kids under ten this year to get presents for. I was able to do three of those gifts completely free (regifting stuff I already had, or making things from stuff I already had). One gift cost $2.00, and the other three cost between $7.00 and $10.00. Teens are a little harder to cheap out on because they have specific wants, especially before they're old enough to be earning much of their own money. Even so, I was able to get one teen gift for around $3.00. So, I think that's about it for this week. I can't believe Christmas is so close! This pic is from 2016. But it's me, at Kroger, getting free hot cocoa. Therefore, still appropriate for this post. Wow, I can't believe it's time for another FA post. Time flies!! Last weeks was rather busy for us and I didn't write down any accomplishments. But like most recent weeks, it can be summed up as "fantastic grocery haul, small cooking accomplishment, cloth diaper breakthroughs, and other random frugality". 2. Cooking: I made lots of meals this week (that I don't remember). I also made cookies and put leftover potluck brownies in the snack basket, which probably saved us a $20.00 snack run. Cookies and brownies are not the healthiest, but neither are Little Debbies (frequent snack basket favorites). I spent $3.00 or less in ingredients for the cookies and brownie mix. As much as I hate to use boxed stuff and mixes, they are cheaper and easier than "from scratch" snacks. I think they're a step up from store-bought Little Debbies, so we're headed in the right direction. Another cooking project I worked on was THM meals. A long time ago I decided that the THM meals would be for me only, not the whole family. For one, some of the ingredients are more expensive, and secondly, Hubs is not a fan of "healthy" meals (that don't taste as good as "regular" ones). Making two separate meals twice a day was NOT what I wanted to do with my time. Finally I found a solution. Instead of making two THM meals every day, I make two family-sized THM meals on Monday; one for lunch and one for dinner. Each meal makes about five servings. I eat one serving and put the other four servings in plastic freezer boxes, labeled "S" or "E". Two of the extra boxes go in the fridge for later on in the week. The other two extra boxes for each meal go in the freezer for coming weeks. You can buy prep-ahead lunch containers on Amazon (and I have four older ones that I got at a garage sale), but I've decided to use freezer boxes because they fit in the freezer better, plus the size is better for my Instant Pot (we don't have a microwave). If I want a THM meal straight out of the freezer, all I have to do is run hot water over the box to release the contents, then dump those contents into an IP-safe glass container and heat it up for 3-4 minutes on Manual. I can also warm up fridge meals for just one minute on Manual. Usually I do eggs and cheese ("S") or oatmeal ("E") for breakfast, and then I can pick the opposite lettered box for my lunch meal. I used this system last week and it worked great. As of now, I'm only doing THM for breakfast and lunch. The other meals (and also weekends) I don't bother making the meals that are THM-friendly. I know you have to do it full-time to get the best results, but with limited cooking time and budget I really need to find something simple that works before diving in whole-hog. I feel like the batch cooking and freezer boxes are going to be key for me. 3. Cloth diapers: we used cloth diapers quite extensively this week. Two new things were 1) sunning in the window to remove stains, and 2) packing cloth diapers in the diaper bag and/or leaving the house with Baby in a cloth diaper. I also received a bunch of Fuzzi Bunz pocket diapers on loan from my sister-in-law. A new development this week has been blowouts. Baby Girl has had very few blowouts/leaks in her short life, but that is changing. For the past week she has saved up most of the poop for one big late-afternoon blowout. Her first blowout happened at Denny's with a cloth diaper. As new parents, of course we thought this was just the worst thing that could happen. Hubs blamed it on the diaper. Thankfully my diaper bag was well stocked with wipes, new clothes and a wet bag to hold the dirty diaper. (If you don't have a good wet bag, I would HIGHLY recommend it. Even if you use disposables, a wet bag is great to hold poop-covered clothes or even dirty diapers until you get home.) Her next blowout happened a few days later at a church thing we were at. The Denny's blowout was bad, but this blowout happened with a disposable diaper. Instead of some poop leaking out the leg hole, I'm pretty sure the whole load shot right up her back with only a token amount staying contained in the diaper. This is why cloth diapers have elastic on the back!!! Needless to say, I'm thinking twice about using disposables during "that time of day", regardless of where we happen to be. Sunning- I connected my stained inserts and reusable wipes with clothespins, and then used hangers to hang them in our sunniest windows. I also hung up a badly stained sleeper (the victim of Baby's disposable blowout). It was amazing! I couldn't believe how the stains (EBF poop- we don't do formula or solids yet) disappeared completely. 4. Christmas preparations: wrapped gifts with stuff I had left over from last year. I also made some gifts for Baby Girl (really gifts for myself... a good excuse for some crafting). I also put our indoor Christmas lights on timers. 5. Renewed a library book on Libby. This app amazingly connects your library card with your Amazon account, so you can send free books to your Kindle. Libby also has a good selection of free audio books. The non-fiction selection is good but limited, but there are TONS of fiction books on Libby. I am not a big fiction reader (maybe one or two books a year), but we watched a little bit of Poldark on Amazon Prime and I wanted to read the book(s) it was based off of. Sure enough, Ross Poldark was available on Libby... for free. It takes me forever to finish a fiction book because non-fiction gets priority, but with Libby I can check out the same book 10 times and nobody will give me weird looks for "hogging" it. I believe that is about it for my frugal accomplishments last week. Beginnings of a chicken fodder system! Apart from selling the goats, November was a really slow farm month. We didn't even buy feed this month. It seems that every day is colder than the last. I've been leaving Baby Girl inside with Hubs while I do chores; it's just really cold for her to be out there. Plus she hates being in the stroller now. :/ Every time I do this I'm so glad we sold the goats. Chores only take about five minutes between dumping new feed in their feeder, collecting eggs and breaking their water. No chicken deaths to report in November. We are up to three eggs per day now, as opposed to two last month. So that's good news! I also started working on a new fodder system for my chickens. I wanted to do this last year (and previous years) but just never got around to it. I got my husband to use his construction whiz skills to build a frame for stacking fodder containers on top of each other. This month I'm going to drill holes in my containers and stack them on top of each other. The idea is to line the bottom of each container with seed for sprouting. Then you water on the top, and the water trickles down to all of the other containers. Each day you take one container of fully sprouted fodder out to the chickens, and add more seed on the (empty) bottom container. This month we used fallen leaves to cover almost all the rows of strawberries. I had planned on doing straw, but I think the leaves will be better because there is no chance of them shedding seeds for a weedy strawberry patch next year. We also didn't have to buy straw. There are still a few uncovered rows that I should probably buy straw for. But we'll see if that happens or not. Well, the good news is that I lost less than a dollar this month! I know I will have to buy feed in December, but that's all I can forsee. I really like the pared-down animal chores this year. We are planning on doing a winter vacation sometime in January, and the goats are one less thing I have to worry about while we're gone. I bought a new laptop last week, which has been AWESOME!!! I got my old laptop in 2008. Not only was it really slow, but it didn't have any audio and... people just aren't making software for Windows Vista anymore. As we were researching different options for a replacement, the old one completely crashed and I couldn't even get it to turn on. We ended up going to the computer store in town and buying a used refurbished laptop for about $350.00. I'm really happy with it so far. I was able to get my writing software (Scrivener) up and running to start working on my frugal produce book again. I started the book way back in January 2017, but put it on hold to republish Menu Planning and have a baby. But now... back in the saddle. Cyber Monday: I bought an Instant Pot lid and extra sealing ring for 25% on Amazon. I also got some new books from No Greater Joy for 45% off. I had been thinking about buying them earlier when everything was 40% off, but I'm glad I waited. Cloth diapers: we cloth diapered five days last week. I've been using my on-sale hemp inserts for overnight diapers, and they work great. 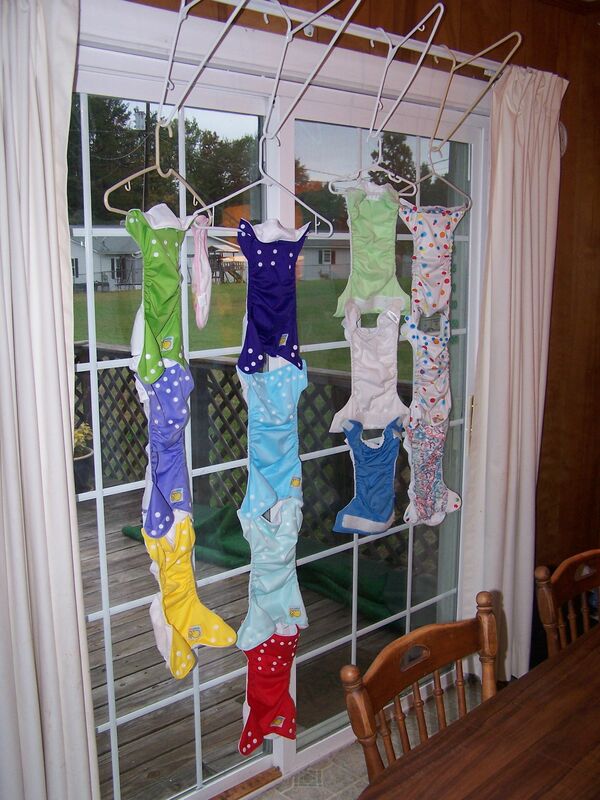 I also found an easy, fast way to line dry the diapers. I use two of ﻿these things﻿ to dry almost my whole stash. First I hang the top dryer on a hook attached to my ceiling. The second dryer is hooked onto the first dryer (one of mine has a ring underneath the center so I can do that). Each clip gets an insert- first on the top dryer, then on the bottom one. On the bottom dryer there are usually some clips left. This is where I hang the pocket diapers. I made four lines of pocket diapers by snapping the bottom of one diaper to the top of the next, like this. The whole setup takes up minimal square feet, and I love that they can hang vertically. Plus there is no messing around with clothespins or line. What remains of my stash- some homemade prefolds that I use as changing pads, homemade fleece liners and reusable wipes- can all be dried on a collapsible drying rack, which takes a whole less time to set up than my indoor line. The drying system was a big win because it will save a lot of time. I'm doing diaper laundry about every other day (except on weekends), so it's not like regular laundry which is just once a week or so. I still want to get a few more pocket diapers to be able to do laundry every three days. Right now I have fourteen pocket diapers and two AIOs. I have some prefolds/fitted diapers as well, but Baby Girl is too big/chunky for them. :( I use about six cloth diapers a day, with a disposable or two(if we're gone, or if Hubs does the changing. Still haven't got him converted yet!). I can go a full two days with diapers and then do laundry, but I only have four diapers to use while the clean diapers dry (a full day if indoors). So I am just a few diapers and inserts short of a full stash.